It’s pretty sleek and feels like a fusion between a UD Bellus and a Steam Crave Aromamizer with more weight leaning towards the Aromamizer. It’s a bottom fill, old school 2 post deck that has direct and indirect airflow hitting the coils much like a side airflow RDA. The branding is pretty minimal with a simple font spelling out ‘Train’ at the base. 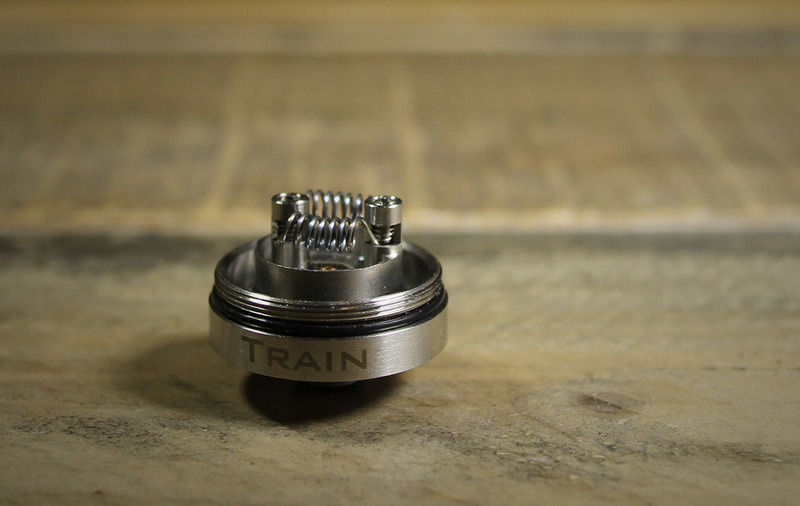 There is some original thinking too, included with the train is a top adapter to covert the base into a sort of RDA. It’s fresh thinking and works pretty well, you do get confused on how to drip though. 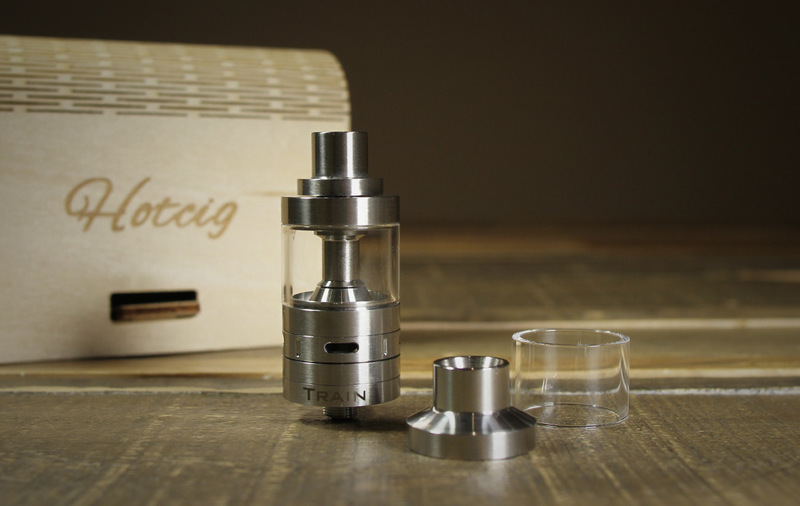 The adapter screws into the chimney, so you unscrew the top and drip down the same juice channels the tank section uses, just from the top. So this means it can handle a fair about of juice (because the channels are pretty tall). The funny thing is the flavour isn’t much different/better than using the tank section, so it’s sort of moot. But we commend the attempt for some originality. Flavour as an RDTA is good, not great, just good. To be honest it’s a little muted, like the Aromamizer it has 4 airflow holes, 2 hitting the coils and 2 coming in from the sides. But the Train differs in that it’s not possible with the AFC to close them off, this would very much improve flavour. Indirect airflow is only good for cooling down the vapor, it always effects flavour. The AFC works, we still wish we had separate control over the direct and indirect flows. Ours has gap under the AFC ring that really effects the aesthetics. We find shutting down the AFC to barely open gives us a nice restrictive draw and helps counteract the indirect airflow, you’ll get the best flavour with this setting. We have noticed some whistling however, but the airflow is pretty smooth as well. Wicking is almost too good, this atty cries out for Juice Flow Control, even with thick VG juices we found that the wicks can’t keep up with the flow from the large juice channels and it will gurgle at times. 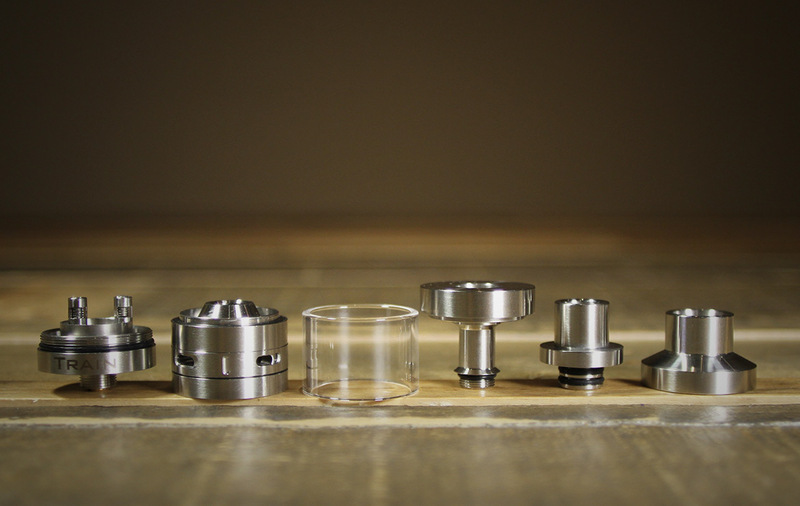 The juice flow system is almost a mirror image of the Aromamizer, the juice is fed under the build deck and flows up to the wicks through 4 holes at the bottom of the deck (2/side, just like the Aromamizer). However the build is noticeably smaller and the coil height makes setting your wicks a bit of challenge (you need a wick hook for sure). We threw in a 7 wrap, 26awg, 2.5mm, dual build, coming in at 0.4-0.5 Ohms and ran it rather high. The Train seems to like being well above 4.2V, it’s sweet spot seems to be around 4.5-4.8V and the wicking keeps up. There is something here, it can push the power and produce decent vapor. But there are some problems too, it’s an old school deck, 2 posts, but with only 2 holes, so it’s the balancing act of setting 2 coils at the same time (we are all getting spoiled with velocity style decks). 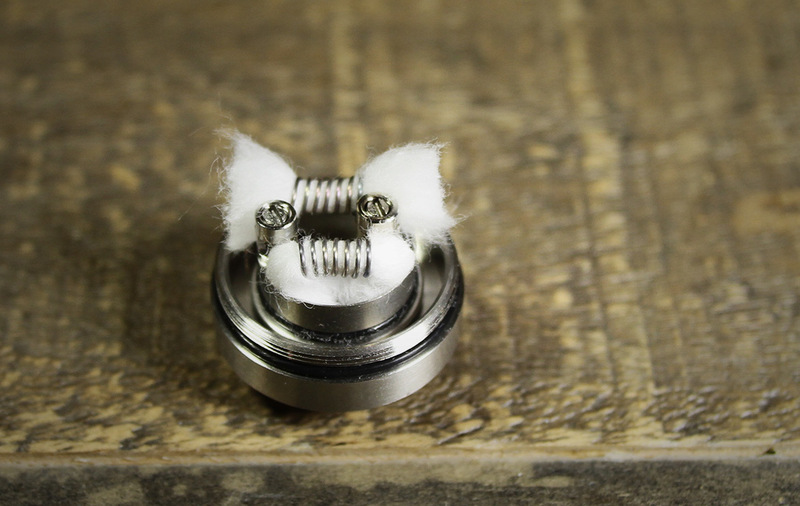 And the post holes are pretty sharp, they will easily clip 28 & 26awg wire, so you have to be sensitive to this fact while also dealing with the pains of setting 2 coils at once, not the easiest build. Hotcig’s little wooden box packaging is pretty original and really pretty cool. 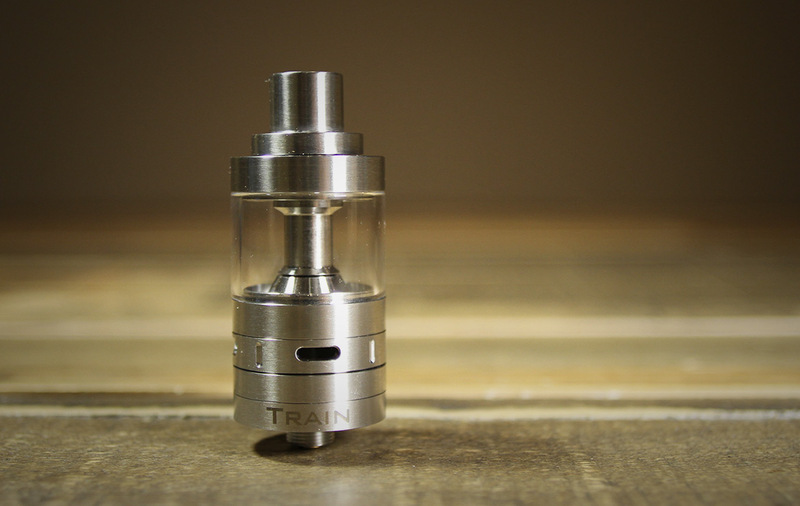 There are plenty of spares, and the included drip tip isn’t for us, but comes off easily and leaves a nice flat top with a universal 510 that will fit your own favourite drip tip. It’s early days, we have hope for hotcig, their new mods (R150 & DX75) look super promising and this first attempt at an RDTA is not bad. Sure, they have work to do, but at least they are trying to go legit so to speak (making authentics). Join our monthly newsletter to get specially curated deals and info on all the latest vape gear & juice.